First shots with my new P01!!!!! Picked up my new P01 yesterday. This is not the omega, I didn't care for the omega. I did a basic field strip, clean and lube job on it. Took it for a spin today, put about 300 rounds down range. 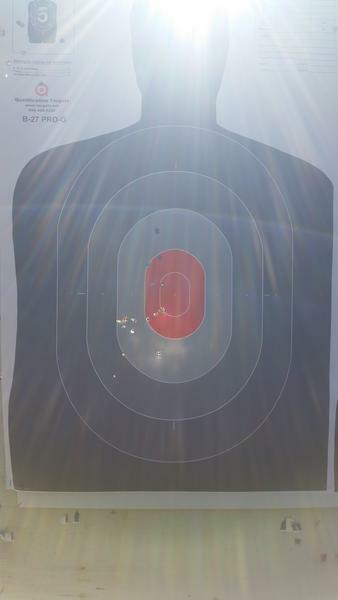 Shot at 7yds, 15yds, 17yds and 25yds. 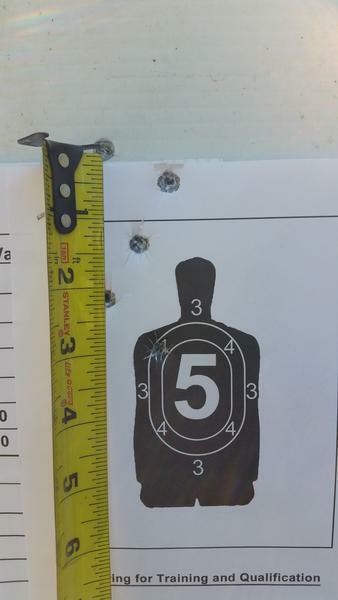 Most of the 300 rds were fmj's , just wanted to try a few carry loads for function. I found the sights usable. Double action pull was good but more than my scale could measure, Single action trigger pull was nice at 4 7/8 lbs. Neither are silky smooth but still very nice for straight out of the box. Trying to decide if I'm going to leave it stock or not....we shall see!!!! The sun was out very strong for a change and unfortunately we spent most of the day looking straight into it. But that's okay cause I was still having fun. I'll add a pic to show how it was from my view. 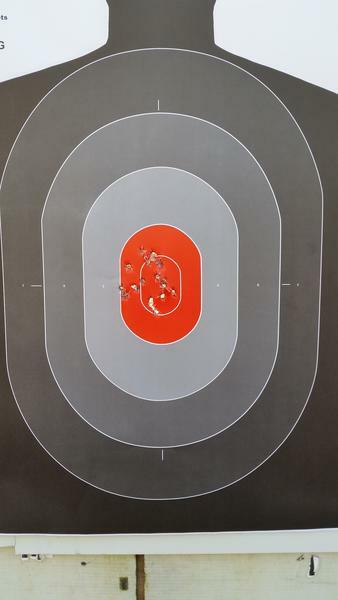 Not that it is a surprise, this pistol shoots Very Well!!!! I had no malfunctions and accuracy was excellent with all ammo shot through it. 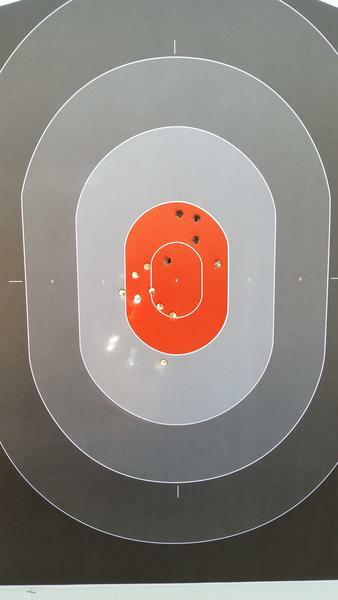 This is the first 10 shots I fired from my P01, the distance was 17yds.. The very top hole was my first shot. 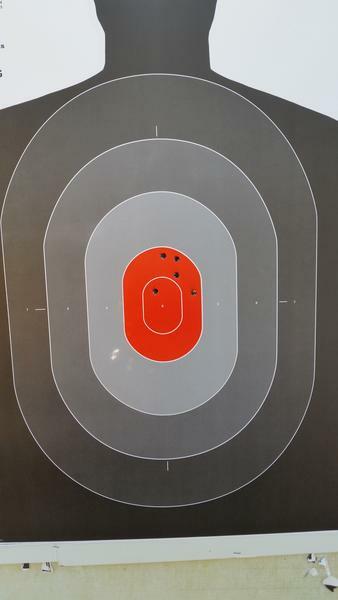 This was 10 shots at 15yds. You can sorta see the glare from the sun. Another glance at the sun!!! LOL!!!! Same target as above. 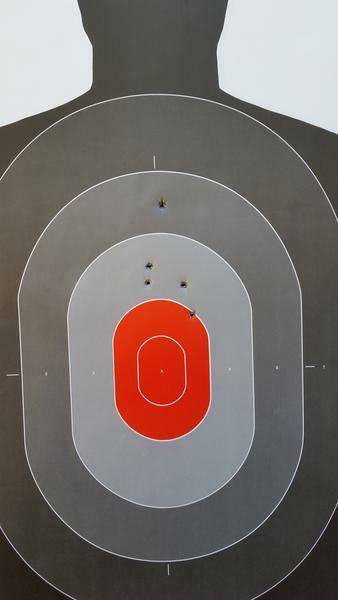 4 more shots with sig crown-v 124gr and 5 shots with speer gold dot 124gr +p. Both at 17yds. Kind of got in a hurry and for got to take separate pics. 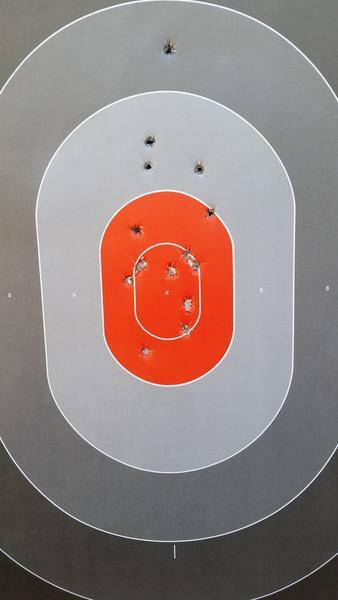 My first 5 shots with rem 115gr fmj at 25yds from a rest. 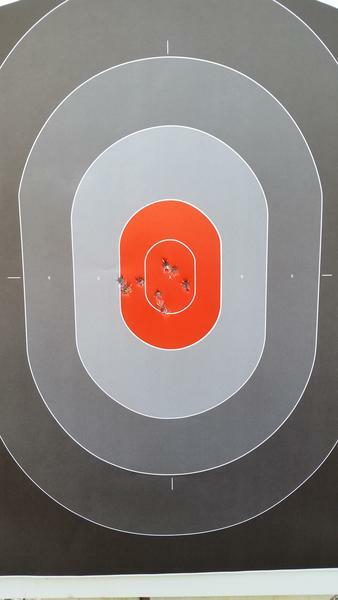 5 shots with S&B 124gr fmj at 25 yds from a rest. Same target as above. 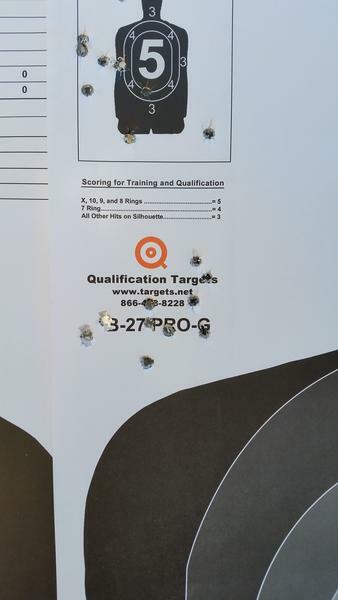 Fired 10 more shots at 15 yds with S&B 124gr fmj's to finish up the day. Re: First shots with my new P01!!!!! 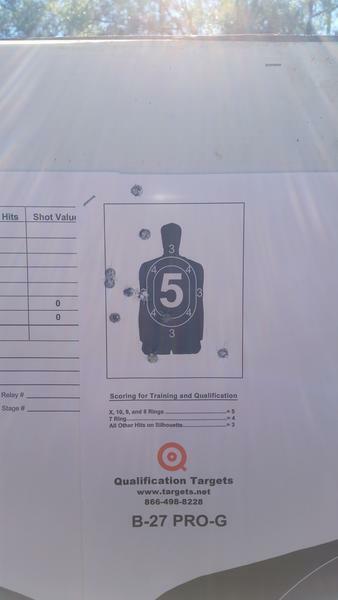 Thanks for sharing your day at the range. I am on the fence between the P-01 and the 75 Compact (not a PCR) and appreciate your info. Congrats! Funny how the 115 FMJ shot high off the rest and right where you wanted them off hand. Looks like the 124 grain shot where you wanted it, too. I like my P01's (mine are both Omega's, but that's got nothing to do with how they fit/feel in your hand). There's just something about that grip. I've stopped carrying the Omega for the winter (I open carry on my property in the winter) but might go back to it when the warmer months arrive as I usually carry concealed then. I do carry the P01 concealed in the winter on road trips so that my wife's CZ75 Compact and my P01 have the benefit of using the same mags/ammo if need be. The P-01 is the gateway drug to CZ addiction. Congrats! Took some time today cleaning my P01. Broke it down, scrubbed it out and lubed it back up. After 300 rds the DA pull felt so much smoother. Put the scale on it and found the SA pull is now at 4 3/8 lbs, still can't measure the DA pull because it maxes out my scale. If I remember correct, the 75 compact has a steel frame. I chose the P01 because of the lighter weight and a rail. Also I didn't care for the loaded chamber indicator on the PCR and it also had no rail.. These are the choices I made for myself and what I wanted. They are all very fine pistols. I did liked the feel of the omega trigger system. The DA pull did not feel as good to me but the SA pull was more crisp. For me, it came down to the decocker. I did not want a safety and didn't like the decocker on the omega. In the hand feel for all of them will be hard to beat for sure. Totally agree... I started with a P-01 and now I also have the CZ Rami BD, the P-07, the CZ Shadow 2 and the CZ Scorpion Evo !!!! Great!!!!! Now I'm gonna be like a crackhead on speed!!!!!! Thanks for the late warning!!! 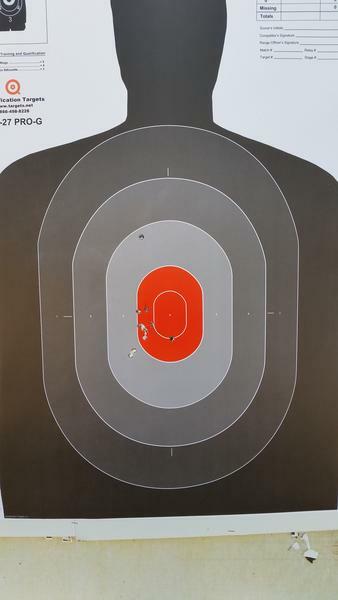 Great gun and fantastic shooting! I stay away from the 115 anyways. Might pick up another P01 Omega this month to match the one I bought last year. It's an addictive brand for sure!